WHY OUR ESPINHO SURF CAMP FOR YOUR SURFING HOLIDAYS? 1.Perfect choice if you want to be close from everything you need and have a roll of options available for what to do, no matter if you travel alone, with a friend, soulmate or with a group of friends. 4.Supermarkets, bars, restaurants, shops (surf shop included) and the train station are very close to the house. And finally, Porto it’s only 20 minutes away by train, and the train station 200 meters far from us. This is a great option for combining a beach and surfing vacation with the possibility of exploring a unique city. Check our Services label for more details. surf spots’ location and description, local points of interest and the best local restaurants are featured on a map available at the bottom of this page. You’re welcome! Our surf house in Espinho, a small city by the sea 20 km south of Porto, northern Portugal, is located just two steps from the beach. It was built in 1939 and still keeps some of its original features, as its high ceilings, walls and tiles. It was recently renewed to be the perfect destination to make the most of a beach vacation in Portugal, especially surfing lovers, who can recover their power in a cozy place socialize with their fellow mates. The house offers 5 comfortable and custom made rooms, one nice common use kitchen, a dining room and lounge areas so that everyone can feel home all year round. Outside, a friendly terrace is the perfect set up for reviewing every day surfing stories with friends. 1 shared room (mixed dorm); featuring a combination of history and surfing vibe, high ceilings and 4 big windows and plenty of light, comfortable single accommodations with privacy. Breakfast, Wi-Fi, towels and bed linen included. 1 double or twin bed room (extra bed option); featuring a combination of history and surfing vibe, high ceilings and 1 big window with street view and 1 balcony with terrace and view; Breakfast, Wi-Fi, towels and bed linen included. 1 Mezzanine private suite with extra bed option. featuring a combination of history and surfing vibe, high ceilings, tv and 1 big window with street view. Breakfast, Wi-FI, towels and bed linen included. 1 private double or twin beds suite, 23 m2 , with 1 or 2 extra beds option. featuring a combination of history and surfing vibe, tv and 1 balcony with street and ocean view. Breakfast,Wi-Fi, towels and bed linen included. 1 master suite with tv and a 14 square meters private terrace. Breakfast, Wi-Fi, towels and bed linen included. Live performance rooms, bars and restaurants and a Casino. Just remember we know where the best local food is served and we’ll be happy to share that! The city agenda, which is busy and covers different type of events, especially during Summer. Check our 2019 Events agenda or ask your favorite surfing teachers about it when you’re around. Espinho Surf beaches are great to explore, but maybe you would like to explore some more in Portugal! The underground train station is 200 meters far from our surf house. You can go to any city in Portugal from there. One minute you’re surfing and 20 minutes after you’re in Porto’s centre. Easy peasy! At the end of the day, remember you can simply come home, prepare a home-cook meal in our kitchen, grab a drink and socialize with the surfing family in the comfort of our place. Any Questions? Check our FAQ label or contact us. 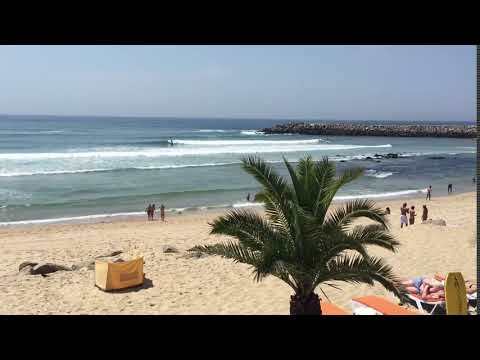 HOW ARE THE ESPINHO SURF CONDITIONS? The Swells are definitely convenient and consistent! If you ever dreamed about waking up in front off the beach without hassle just seconds away from surfing, well… our Espinho surf camp experience can make your dreams come true! Two steps away from our surf house, the queen of surfing spots in the north of Portugal is located: the Bay spot! Espinho’s waves offer top conditions from beginners to advanced surfers. Beach breaks and point breaks that hit on the sand. Even though some crowd is there sometimes, it’s nothing if you compare it to spots like Peniche, Ericeira or Algarve. We pride ourselves on a close approach and a personalized relationship with our visitors, kind of like a family relationship. That shows in the way we set up our surfing lessons and our surfer/teacher ratio. Surf courses, single surf lessons and surfing rentals are some of the surf-related services we have on offer, besides SUP tours, yoga, bike rentals and transfers. Because we know the place like no-one, we’ve created Surf Vacation Packs that serve our visitors’ best interests! Check all the possibilities on our Services label and see Magicseaweed Surfing Forecast for Espinho. Make sure you read them carefully, as well as our Terms & Conditions Policy, so that all the waves can be ridden peacefully. – guests are responsible to clean the used dishes and leave the kitchen like they found it. Check-in: 15:30 pm-22:00; late check-in on request with a minimum of 48 hours in advance. – leave the metro in Campanhã station (Oporto) and go to the train spot, which is right over there. Then take the train heading to Espinho (Aveiro line). Use the same card you got from the airport’s metro. 20 minutes journey approx. But if you don’t want to bother with schedules and timetables simply ask us for an airport transfer (LINK to Services page). Nice and easy! We’re waiting for you here to offer you a full Espinho surf camp experience!